Update: The May 26th release date for Japan now also applies to Europe and North America! Ultra Street Fighter II: The Final Challengers looks set to please old-school fighting fans when it launches on the Switch later this year. We liked it in our hands on impressions anyway. While the exact release date is still up in the air in Europe and North America, Street Fighter producer Yoshinori Ono has confirmed that the game will be out on May 26th in Japan; it will cost 4,990 yen at retail and 4,620 yen on the eShop. Hopefully we'll hear some news on the Western release date soon. Will you be picking this bad boy up for your Switch later in the year? It's a rip-off price. That's €40 when converted and likely more expensive by the time it gets here. Capcom trying to make a quick and cheap buck. Yup, sounds right. Just in time for EVO players. Here's hoping it doesn't take too long to come here. $40? Ehhh, no. I'd think about it if it were like $15, but no way I'm going in on it for that much, especially when I already own Turbo HD Remix. Granted Capcom has constant digital sales anyway so I'm sure it'll be available cheaper sooner rather than later. I done a currency exchange from Yen to Euro. It is exactly €41 at the moment while the eShop version is €38. I'll mostly likely wait for a sale when the game is out. So $40, give or take? Plus you need a Pro controller to play it properly. Ick. $40 for Street Fighter 2?!?!?! WHAT!!! Insane pricing. Sho ryu can't do better, Cacpom? They really missed a trick leaving out Spiteful Chun Li, Unpleasant Zangief, and just plain mean Guile. I'll be sadly skipping this purely because of the price. Outrageous! Rip Off. If it was a collection of games I'd totally buy it though. MAY?! Aww...I was hoping it would be sooner. Would have been great for my lunch breaks. Ah well I can wait. Please port 3rd Strike Capcom...please? On the one hand, you'd be telling Capcom that we want more fighters on the system if we brought it day one. If it was Alpha 3 or 3rd Strike maybe but...nah. Not at this price. Just an odd thought, but what if Capcom took a risk, & launched it, digital-only, for about $5-20, $15's better(a sweet spot), & see how much they could make on that, as opposed to $40, or $50. Then Capcom can do more, than just putting X in the next "Marvel Vs. ..." game. They can actually, I dunno, make a Mega Man game. Classic, &/or X, please, & thank you, Capcom. Is the Switch cartridge so expensive for game developers ? @Anti-Matter: $40-60 is usually the cost (to the consumer) of new video games. Supposedly, when all is said, & done, this is the cheapest most retailers claim they can go, before they make no more profit on the game. Can't wait to play with assertive Bison, depressive Chun Li, calm Blanca, nice guy Vega, troublemaker Camy, scared Zangief and exalted Guile! Will be picking this up.. however.. this seems somewhat overpriced compared to what it should be.. Early Switch adopters may not necessarily like waiting, even just 2 months for this. I'm referring to the update that the release date also applies to U.S. Edit: Though, my point is also valid for the other territories, too. They are really dropping the ball on this. The reaction to the pricing is completely negative on twitter. Would've jumped on $30 with Best Buy Gamer's Club dropping the price to $24. Even $32 is a bit much for what it is, though would like to have the cart. Nintendo does what other companies do not. I'm used to $20 games selling for $30 physically, and $30 games selling for $40 physically. Wow. That price. Really surprising me. Actually it's on the Nintendo eshop so everything's over priced. @JaxonH Yep, always glad to pay a little extra for a cart, if reasonable. Hoping some of the bigger indies (Yooka, Fast RMX, Rime) get a physical release. Super Street Fighter II HD Remix. The game will hit the PlayStation 3 on November 25, a full day earlier than the Xbox 360 version. It'll run $14.99 on the PS3. Take note of the above statement. Same game with two new characters. Lol at the $40 switch price. Bomba guaranteed. $40 + cost of pro controller to play the game properly. $100+ to play a game released for $15 over 5 years ago. Why is this so far away! This should be a launch title! The f**k!? SFV is currently available for less. Shocking. Absolutely shocking. @Rocossa Well you have to rememebr it also includes that gimmicky first person motion control game. But yeah, still not worth $40. I would have maybe bought for $29.99 at most just because of the nostalgia factor. Too late and too expensive. I'll scoop it up if it goes on sale. The game it is based on cost $15 when it launched 9 years ago. 5 years ago it launched as part of a Digital Collection on Xbox 360, where for $40 you got it and 7 other games on a single disc. Does a first person minigame, 2 variant characters and an art gallery warrant almost tripling the price? Capcom can spinning bird kick themselves right off a bridge. Wow, I was really looking forward to buying it for 9.99, which seemed the only reasonable price point. @Ryu_Niiyama "Please port 3rd Strike Capcom...please?" @Decapre I believe Capcom is the one who put this price, not Nintendo. @Azooooz I don't think so, Nintendo is still selling decade old games like Star Fox 64 3D for 39.99. Lol. That price. Even at less I'd have to think about it as I'd rather play SFV. If only that one wasn't exclusive. $40 in the US is pretty high. Is this coming out physically? As everyone has already said, that price is crazy, especially as I paid something like £10 for the exact same thing on Xblah. I would pay that much for a Final Fight HD though, but I really love that game! Ok... Now we are facing the truth, and we can't handle it. Nobody was really - REALLY - hyped with this SF. Everyone thought it would be priced like the hd remix for ps3/x360. Then it would be something cool as a launch title. But that was not capcom's plan. And people are not sad only because of this price, but also it won't be a million seller success, and most of the people here are fed up of seeing crappy ports not selling well and reading that "nintendo customers don't buy our games". (Insert comment whining about the price) ... Oh hey. May 26th? That's my birhday. Neat. I mean. GRRRR!! It's so expensive and releasing so late! How dare they!! I'd think about it for $15, and definitely get it for $10. But $40? No sir. And this is coming from someone who isn't that annoyed by the pricing of Bomberman R.
Replace Ryu with this game and Ken with the Switch (and, by extension, Nintendo's) audience and you get the situation. Good luck playing this overpriced game with your joy-cons. So many things wrong with this. Good god almost as bad as the price set for bomberman R!! What are these guys smoking?? Both should be $20 each tops!! Exactly. The game will have the HD mode, 16 bit mode, first person mode, two new characters, online lobbies and a spectator drop in mode and we still have people whining. I know I'll be all over this game and that box art is dope. To each their own. @Decapre Star Fox 64 3D was only $19.99 at Best Buy though, not too long after its release. $39.99!? What the hell! No version of Street fighter 2 is worth forty bucks. Terrible pricing. @NTELLIGENTMAN Not on the eshop. 40$ and they covered Cammy? Wow. Capcom might as well go the way of Legends 3 and cancel themselves. Seriously mad that Capcom has buried it's best properties with all their Nintendo-esque bs. @Ryu_Niiyama I 'd love a 3rd Strike port(with online), even willing to pay $50 for it! But $40 for sf2? I'll be fine without it. That price can burn a scar on your chest. That's what I paid for SSF4 SIX years ago when that launched alongside the original 3DS (and had considerably better production values and 3D graphics). I can also grab SF5 for less than half the asking price for this on PC. I'll probably grab this at some point, but only once it's dirt cheap. AU$60 is disgustingly overpriced for such a simplistic looking 25 year old game. This is just extreme laziness on Capcom's part. Ultra Street Fighter IV on Switch would have been preferable to this. I have no nostalgia for the poor quality and collision detection of the old games. Keep the past in the past. There are plenty of indies around to pump out games with antiquated production values. FYI, we expect better from major publishers. If retailers sell it for say AU$45 at launch, then I may bite (if there are a lack of games, however, Fire Emblem Echoes is being released that month, so...). Yo, Capcom. Where are them Resident Evil games at? Isn't it about time Nintendo players finally get to play Revelations 2? @EllenJMiller "Capcom can spinning bird kick themselves right off a bridge." Whilst everyone is crying about the price i am actually genuinely looking forward to this game. 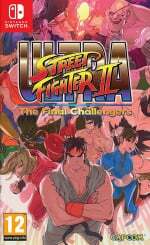 I love SF2 and whilst this is a only slightly altered version of HD it is still a new game in the franchise and im definitely getting it. I'm interested in this. But for that price... no. I'm not sure. Along with Bomberman, if they'd have been £15 physical and £12 digital I would have bought both games. Probably at launch. Yes, I may have actually bought the console at launch to play them. But at the prices they are I simply can't justify it, and don't want to encourage it even if I could. When I eventually buy my Switch, probably around Christmas, I expect these will be available second hand for about £15, and I'll pick them up then. Shame really. PS do we know of a solid price for Sonic Mania and if it has a physical release on Switch? Capcom and Konami should've done a reality check and half the prices of their Switch launch games. I would need a pro controller to play this too. I love that box art.